We have been involved in the horse industry for many years. Raising horses, showing locally, 4-H, and lots of trail riding! In 1999 we sold our original farm and moved to Austin Texas for a few months (LOVE Austin!). We moved back the spring of 2000 and bought a farm in Pierz. At the time we were down to only 2 horses, but shortly after the move we got involved in horse rescue. We are very happy to have been able to give many wonderful horses loving homes. In 2002 we moved to a farm in Pillager, MN. As time has gone by, we have had to lessen the rescue aspect of our ranch a bit, due to overwhelming feed and vet bills but we still always have rescues available. We also buy and sell and do rehab. We always have an assortment of horses looking for homes and would be happy to help you find the one you're looking for! A big THANK YOU for all that have emailed suggestions for new advertising venues for us! We figured we'd start with this web page, and go from there! www.midwesthorsetalk.com Fun new horse forum! www.trot.org Saddlebred web page, includes forum and ASB rescues! www.goldmineranch.com Offering boarding, breeding, events, sales, and more! www.safesanctuary.org Very reputable companion animal adoption! www.rockingk.com Speed bred Quarter Horses and Horse Transport! www.ncrha.com North Central Reining Horse Assc. Meet Amos! 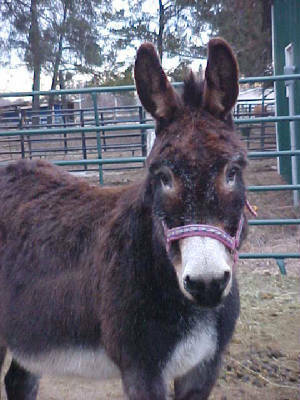 He's in his new home now but is one of our favorite donks!